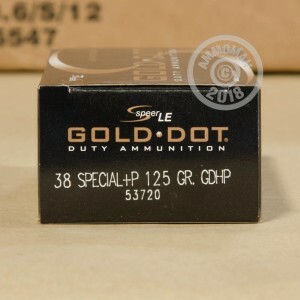 A common choice for CCW firearms and police backup guns, these Speer Gold Dot .38 Special +P rounds are an excellent self-defense round for a .38 Special or .357 Magnum pistol. They use a 125 grain bonded-core hollow point bullet specifically designed for the cartridge and optimized for good terminal performance in it. The Gold Dot hollow point is considered one of the most reliable rounds available due to its molecularly bonded core, which combats core jacket separation. Thanks to this proprietary process, the Gold Dot bullet maintains its integrity as it strikes an assailant, enabling it to rapidly penetrate and expand along pre-cut "memory lines" to neutralize him. This ammunition should only be used in firearms rated for +P ammunition. Owners of older revolvers should note that today's +P ammunition is comparable in pressure to standard pressure .38 Special from before 1972, when SAAMI downloaded the cartridge's standard pressure specification. Therefore, many revolvers manufactured prior to 1972 may be safe to fire with +P cartridges. Check with the manufacturer if unsure. 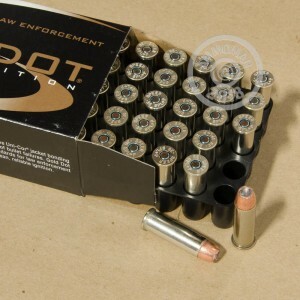 Purchase this 1,000 round case to reap bulk savings and ensure that you're prepared for all your training and self-defense needs. 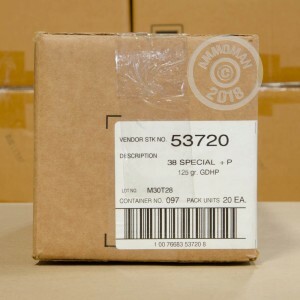 All orders over $99 at AmmoMan.com ship for free!